John Hitchcock was out for his usual weekend row in his St Lawrence River Skiff and he came across this fellow behind Best's Island, Waimea Estuary, Nelson, NZ, just before the easterly blow came ripping through. John had seen your post re the gunning punt and I had told him about my ancestors at Lake Waihola. He asked if he could take a photo but otherwise didn't get much information, so I don't know if it was a special gun for use on the water; I have been pondering that a bit and I suspect that he just keeps it well oiled. I don't know a lot about guns although my father was a deerstalker and there were always guns about on the farm. There is a whole dismantling and cleaning ritual associated with them and this chap would have to be assiduous about maintaining it. I wondered about recoil and whether the line of fire has to be aligned with the canoe. The gun certainly looks the business, and seems to be on a pivot so it could be aimed offcentre. I imagine you have to be careful for the recoil not to turn you over. 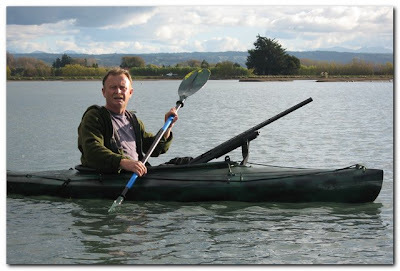 Using a canoe rather than a duck punt would demand a different style of hunting, because the hunter sits up and paddles, thus presenting a much bigger and more obvious threat than a duck hunter lying down in the punt and stealthily sculling over the transom.